Have you used the new ‘Managing Catch Up®’ videos yet? 17th October 2016 - Have you used the new ‘Managing Catch Up®’ videos yet? Lots of you have got in touch to tell us how much you like our new ‘Managing Catch Up®’ videos! 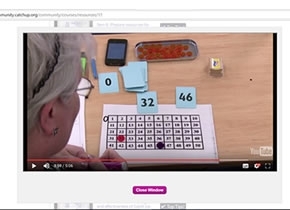 If you haven’t had a chance to look at them yet, these training videos are based on our 10-point Coordinator action plan and are designed to help you introduce and manage the interventions, with tons of useful advice on everything from telling parents about Catch Up®, to identifying learners, timetabling and preparing resources. Even if you have been delivering Catch Up® for a long time, you might find something useful to help enhance your practice – particularly in the ‘supporting and monitoring Catch Up®’ videos. Use your unique username and password to log in and start using the videos today! From next month, it will be possible to book additional training sessions at your closest Regional Training Centre, from your online logged-in area. These will appear in the ‘Training’ tab of your user account. Once you have been delivering Catch Up® for at least six months, or when you need a refresher of practice, attend one of these sessions to share and feed back about how your practice is going and get further guidance from your Catch Up® trainer and each other. Discuss impact, review the four stages of Catch Up®, complete an observation proforma, monitor an individual session record sheet and more. Book your session online soon! Coordinator network meetings and in-depth workshops will also be bookable online soon – look out in the next newsletter for more on these and for news of our Progress Reporting tool. This brand new Progress Reporting tool is now being tested in a small number of schools as we move into the last stages of development. News of launch date coming soon!